It’s always hard to do anything at all in life when life gets in the way. Last week, life majorly got in the way of all dissertation related endeavours. I do now have a supervisor for my project and the few people that have asked really like the story idea so hopefully, this will come off well. So I flew in to this week with commitment and confidence that only life could ruin… Well life and whatever tawdry low-budget tosh my friends have cared to tape from the Horror channel and play over take-out and friendly banter. Which is where this weeks journey began. Shortly followed by finishing some sketches and one lines for BBC Radio 4 that didn’t get used. Sad face. Fast forward to Monday. 5am. Awake. I’ve never got up that early on purpose unless to catch a flight. But this time it was to meet one of the heroes of my, and my friends, life. The actor, bodybuilder, writer, businessman, politician and Austrian (that counts), Arnold Schwarzenegger. Early morning rises are not fun at the best of times, even less so when having to stand outside Waterstones in Piccadilly from 7:30am and only just make it into the queue. The man at the front had been there since 7pm the night before. 12 HOURS! 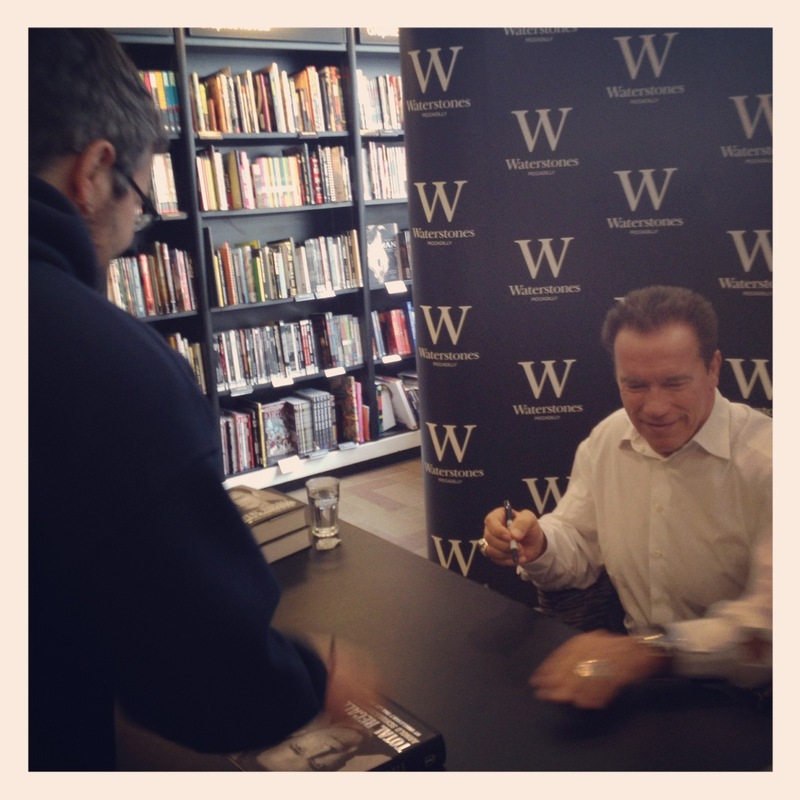 I can’t imagine that, as the one thing I would not want to do when getting Arnie to sign my book is smell like I’ve slept on a London street overnight. But we got in, were rushed along with hardly a hello or a handshake, got our book signed, ate a burger and left. But it was totally worth it. Here’s my good friend Charlie (@brownsell) getting his book increased in value. Later that day, via the medium of twitter and random contacts, I had a small open spot doing stand-up at UCL for Tuesday. Obviously whenever I do any comedy I always feel completely nervous, way out of my depth and a complete phoney. But that’s half the fun. It went quite well, the other acts were astounding (Tony Law a particular highlight) and I survived. However I was doomed to get the last train home (1:30am). Bearing in mind I had to be back at LMU (which I’d just spent half the night criticising) for 10am, I was one sleepy Sean. Panda eyes in full effect. So, lets be honest. Going out drinking with friends after lectures, watching the England game and being out until 10:30, really isn’t a great idea. Especially when you have so much reading to do and writing to think about and after I’d just started a new gym regime. So I spoilt that with Nando’s and alcohol. But I still felt pretty good going in to Thursday. Back to the gym and then to a hospital appointment was the plan. I’ve recently been in hospital for an operation so I had to have a check up. Positive: Got to read a crap load of a book whilst waiting to be seen. Negative: I had to wait for an hour only to get crappy news and have nothing except the crappy book I had to read. This completely ruined my day and brought back a lot of other problems. Life yet again throws a curveball (baseball reference – see I’m learning). Friday however was fairly ordinary and life did nothing but plod along taking me in its wing for lectures, a lot of reading, meetings, home and gym. Which led to Saturday where gym also occurred as well as some reading. But in the end, it led to many friends on my bed, lots of drinking, a terrible hangover and yet more sobering realisations that I probably, and very dangerously, vomited in my sleep. Not cool. Fast forward to Monday (now) where I am documenting the week’s distractions, which in itself is a distraction from reading more university stuff and researching. I’ll catch up this week before an AWESOME NFL WEEKEND! I guess I’m easily distracted. Thirty two thousand, five hundred words. Over the course of the next year, that’s how much I have to write – minimum. The bulk of that will be my dissertation, but the rest is all the little essays, presentations and commentaries. If you want to put that in to perspective, that’s around 16 average sized essays over a year. Or half an average novel. Or 31,750 more sensical words than the average Ultimate Warrior WWF promo. I must admit that it’s a bit daunting. It’s a bit daunting to do the entire 10,000 word short story, even though I mostly have it sussed. I have to research several elements of this to get it right. First I have to find the right affliction (which I think I have). Then I have to map the route this journey will take. Then I have to think practically how these people in their situation can get to the even they are meant to get to so that I can navigate them to the end of the story. In between that I have to create some dramatic tension, a sense of relation with the reader and I have to right confidently enough and strongly enough that I can hook a reader with the first paragraph and keep them there for the next 9,600 words. Thats the last thing of course. Before then, I have lots of smaller tasks, at least 15 books to read, analyse, discuss and critique. Oh woe is me (sarcasm). You know, I chose this path for my life. I was aware, although somewhat less informed at the time, of the gravity of my choice. What I would have to do, the level of maturity and commitment it would take to develop not only my skills but my mind and my attitude towards this career of writing. Writing is solitary confinement for the emotionally crippled and the socially self-masochistic. Over the past two years, I’ve desperately tried, as I probably did for the years previous to that, to hang on to the last strands of youth. To find what I always craved in love and muse and to actually be happy and productive. I now know that can’t happen. I don’t mean that in a defeatist depressing way at all. Lots of people can find happiness in life and work. I however am not one of them, at least not at this stage in my life. What’s with all this emotional baggage, Sean? Well, it’s precisely this: I need to forget all of that. Everything. I need to exist in the bubble of reading, writing and creating. I need to forget the late nights boozing with people years my junior. I need to leave the baggage I’ve created for myself with love. I need to forgo any commitments for the most part that detract from the pursuit of writing. There’s a picture next to my desk on the wall of one of my favourite movies, Casablanca. Champagne is being poured in glasses on a piano that Sam is playing. Rick Blaine is pouring it whilst looking directly as Ilsa Lund who is looking away and down, unable to meet his eye. Because she knows deep down the truth of the matter that this around her, her wish, cannot be. Rick realises this and starts the process of sacrificing for their benefit. In the same way, I must sacrifice all of this for the attitude of writing. If I don’t, then how can I call myself a writer or continue as one post-university? I need to get this frame of mind practiced and the year long task of producing as many words as half a novel serves no better purpose than to do that. If I can do this then I can do anything. Some things, as I’ve come to learn the hard way, are harder to let go than others. Some I don’t think ever truly leave you. But as I tweeted recently I know when I publish that first book what the dedication will be. It might lay some ghosts to rest, or it might excise them. Either way, then is the time for reflection and for life. Until then I must carry on with this plane of thought because if I don’t, to paraphrase Rick, I’ll regret it. Maybe not today, maybe not tomorrow. But someday and for the rest of my life. Sean sits in front of his computer and starts typing the end of his story in full. This final paragraph will serve as his goal to reach. Tap, tap, tap, tap, tap. Reading: Waterland – Graham Swift; Japanese Phrases for Dummies – Eriko Sato PhD.